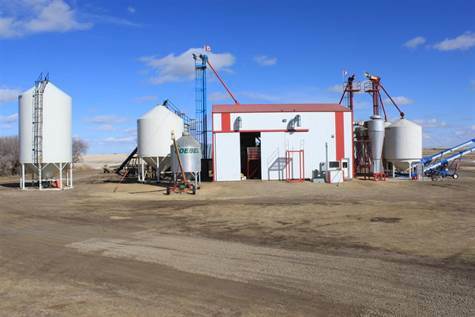 Don’t miss this opportunity to own this modern seed cleaning plant on 160 acres located 20 km north of Luseland Sk! The modern and well designed plant has the capacity to clean up to 400 bu/hr, the owner has cleaned 300,000+ bu per year of primarily peas, cereals, and flax. Opportunity exists to expand the business to meet the strong demand to clean for export markets! House is a 1,120 sq ft bungalow (built in 1964) with a 5 bedroom (3+2) 2 bathroom layout. The large kitchen has plenty of cupboard and countertop spance plus a large walk-in pantry. Adjacent to the kitchen is the living room, and completing the main floor are the 3 bedrooms and 4 piece bathroom. Downstairs you find a large family room, storage room + cold storage, 3 pierce bathroom and utility room, please an additional 2 bedrooms. This is a solid, well maintained house, metal roof in 2018. -	20 x 22 garage, concrete floor, power, single overhead door. -	26 x 60 barn plus 14x60 lean-to. Barn has concrete floor, and 24 x 26 mezzanine storage area. -	32 x 48 x 28 high straight wall building constructed in 2008. -	Feed legs between the indent cleaner, Air Screen, and gravity table, plus a middling leg.